Of course many of you asked us if we were crazy going south into Mexico (and beyond). Well, maybe. But we wanted to give you a report on the security and safety situation here now that we've nearly traversed the length of Mexico in more than four months of travel. First of all, our biggest risk here is the same as the biggest risk has been from Canada on down. It's getting wiped out by traffic. We're out there on the side of the road every day and we're vulnerable. One sleepy driver can swerve to the right just a little bit and we're history. We know it happens, and so do you. We have two main strategies here. We try to find the less-traveled roads using the best maps and information we can come up with, and we use mirrors on our helmets. First, we try to find the less-traveled roads. It doesn't matter too much how wide the road is if there's nobody on it. So we've had a number of delightful roads this way. (However, there have been fewer of these for us south of Puebla due to the mountainous nature of the terrain - many times there's only one way to get from one place to another.) We use the excellent Guia Roji map set and look for the "yellow roads", the paved secondary roads, whenever we can. And we ask about the road and options ahead all the time. Second, we try to know everything that's going on behind us. Our "Bike Peddler" mirrors that mount on helmet or eyeglasses let us scan for everything in back of us and we can see everything head of us. Basically, we try to anticipate every traffic situation and discretion is the better part of valor. Most of the roads we've been riding on for the last month are two-lane, windy mountain roads, with no shoulder and moderate traffic. If there's a semi-truck in the oncoming lane, and a bus coming up behind us, we just get off the road. If it's a car coming up from behind, maybe we'll just hug the edge and let them work their way by - they have better brakes anyway. The good thing is that windy mountain roads mean slower traffic, and they can see us from a far distance they have more time to avoid us We also we can hear them coming most of the time which gives us more time to access the conditions. We feel like we've gotten quite good at what we call the "dance". In the US and Canada, it seems that everybody just learns that driving is "staying between the lines." So when we're riding on the highway, they think they can come as close to us as they want to as long as they're "in their lane." But mostly we don't see that in Mexico - here they're used to obstacles and slow vehicles and animals on the road, and they do their best to anticipate and resolve these issues. 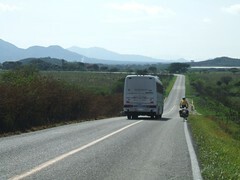 We respect the Mexican drivers, and the vast majority of them have shown respect for us. We respect the truckers need not to stop behind us on a steep hill, and they seem to have done their best not to kill us. I won't say that this is a place for amateur riders, or that anybody would be as comfortable as we now seem to be. No shoulder and too much traffic is not optimal for bicyclists. But we're pretty amazed - we can handle a variety of road traffic, and can handle it without overdosing on adrenaline.